Oooooooo…I like!!!! I hear the barbers would eat once a month as they believe it helps cleanse their system of those little bits of hair that they might have inhaled or swallowed and they would stick to the sides…and they need this to flush them all out. One word – DELICIOUS !! Not many people eat/can accept pig blood curd, I call it “chue huet” (pig blood – direct translation) here.. Many many yonks ago, when I went back to Penang (my grandparents were still around then), I would indulge in curry mee with pork blood and also kuey teow thn’g with duck blood.. Here in KL, it’s hard to find them anymore.. But sometimes I see pig blood in “chap farn” eateries, that’s all..
HB, pig blood is not bad in tea house in San Francisco serve in a bowl with other organs very tasty. Never tried this before but I’m darn curious about trying blood curds or blood sausages since Anthony Bourdain is always eating something like that in his shows. Hahaha. looks… guess i am not into it. haha. any health benefits? i just for the sake of flavour. I did try the scottish version, the fried pig blood. not sure what’s the name already, “haggis” or something. The name is black pudding. Haggis does not contain blood but contains lung, heart and liver of lambs/sheep. My spouse loves eating pig blood curd. I tried it once but did not like it because it tastes very “siang” to me. 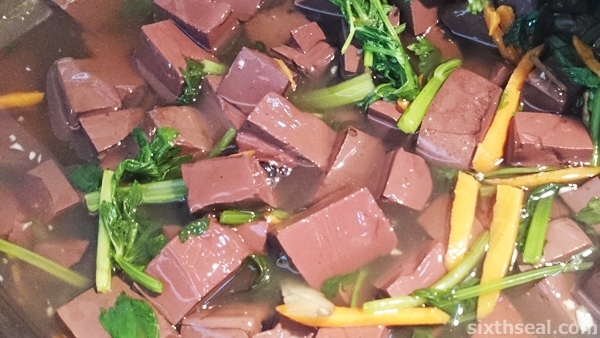 In taiwan, they have duck blood curd too. But I have eaten black pudding in UK (made from pig blood and oatmeal) and like it. I guess I like it because of the oatmeal. Arhhh… somehow since childhood, I can’t take this! mun thanks for the update. good to refresh some memories. still, blood, havent found one i like. am not keen on this but husband like. In Taiwan they still have duck blood curd.